Davinder Sandhu hails from the village Narli in Punjab, Northern India. He was born in Agra, India in 1955 where, his father who was in the Army was posted. He came to England in 1966 as an 11 year old and attended Spring Grove Grammar School in Hounslow, which later became Lampton Comprehensive. After attending 6th Form at Kingston College of Further Education he entered the Royal Free Hospital School of Medicine, London University in October 1975 and qualified as a doctor in 1980, undertaking his medical house job for Prof Dame Sheila Sherlock the famous liver specialist. Davinder Sandhu decided to pursue a surgical career and his first contact with Leicester was in 1983 when he spent 6 months as a junior doctor at the then Cardio Thoracic Unit at Groby Road Hospital. After completing his junior surgical training in Nottingham he joined the Leicestershire Surgical Registrar scheme 1985 -1988 and was Urology Registrar to Prof Sir Norman Blacklock and Nick George in Manchester for a year when he won the Surgitek Prize in 1990 for the best national research paper. He completed his Urological Training as a Senior Urological Registrar in Derby and Nottingham 1990-1992 followed by a successful career as a Consultant Urological Surgeon in Leicester from 1992 till 2005 where he was also the Deputy Postgraduate Dean 2002 – 2005. He was the first to start peripheral urological clinics at Market Harborough and Coalville hospitals. He specialised in the treatment of Prostate Cancer and played an active part as Treasurer of the British Prostate Group. His MD (1994) was from Leicester University and his research thesis was on Vas Deferens Damage and Inguinal Surgery. This subject was important as vas deferens damage can produce male infertility. Leicester gave him an opportunity to pursue his hobbies of Cricket, Music and Literature. He was a Council Member of the Lit & Phil from 1999 – 2009; Secretary from 2001 – 2003 and President 2004 -2005 when his presidential address was on ‘Literary Medical Men’. For a number of years he was Council member of the Leicester Medical Society as well as Treasurer. An enthusiastic member of the Leicester International Music Festival he was a Board Member 1999-2003; Chairman 2000-2003 and was made Vice President in 2004. He continues to support young musicians by becoming a Trustee of the Fiona Ord Music Trust in 2003. For a number of years he contributed to local Asian Sabras radio as a co -presenter with Dr Hirani of Asian Classical Music and Urdu Poetry. A lover of cricket he was a keen supporter of Leicestershire County Cricket Club, helping with player benefits especially with Jack Birkenshaw’s benefit in 2002. 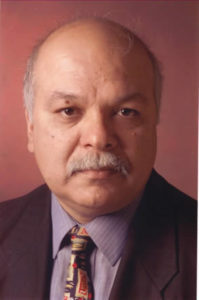 In 2005 Davinder Sandhu was appointed Postgraduate Dean of the Severn Deanery and awarded a Visiting Chair in Education by the University of Bristol. The Severn Deanery headquarters is in Bristol and the foot print includes the counties of Avon, Gloucestershire, Wiltshire and Somerset and runs from Swindon to Taunton. This includes 8 Cities and 12 NHS Trusts with responsibility for 2,274 trainees and a budget of £82.5 million. His national roles are as Lead Dean for Rheumatology, Rehabilitation Medicine, Endocrinology & Diabetes and Oral Maxillo Facial Surgery. He is also the Lead Dean for training interface groups in Cleft Lip and Palate, Head and Neck Surgery, Aesthetic Reconstructive Surgery, Breast Oncoplastic Surgery, Hand Surgery and represents Council of Postgraduate Medical Deans on the Joint Medical Consultative Council. Prof Sandhu continues to contribute to postgraduate education nationally and internationally. He has published over 40 original papers, is editor and reviewer of several journals. His current interests are on Leadership and Organisational Change. Sketches of Literary Medical Men.Transactions of the Leicester Literary and Philosophical Society, Vol 99, p 2-6, 2005.